This blog started as my movie marathon — watching a movie a day for a whole year — and has continued as a place for me to write reviews about movies, TV, and various other items. A Naval veteran arrives home from war unsettled and uncertain of his future - until he is tantalized by The Cause and its charismatic leader. 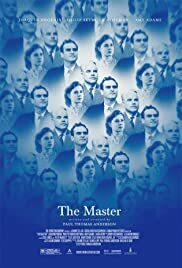 BEFORE: Continuing with the Philip Seymour Hoffman chain is tonight’s The Master, the widely talked about new Paul Thomas Anderson (who directed There Will Be Blood) film. From what I’ve heard, this seems to be one of those films where you really have to see it to understand what is going on and a simple plot synopsis or trailer won’t do the film justice. So, it should be interesting to see both how the film is and how in depth I’ll be able to go in the review. AFTER: From what I remember of There Will Be Blood, The Master seems very similar to it. And that’s not surprising considering that the script included scenes from early drafts of the former according to the source of all knowledge. Many of the feelings I have towards The Master are also very similar to There Will Be Blood so if you’re familiar with one, there is some overlap for comparisons sake. And then there is Hoffman’s performance which is deserving of his Oscar. It really is unlike any of Hoffman’s other roles and yet he does such a great job portraying the trauma Capote experiences as the story unfolds. There were similarities with his previous roles, especially that of Truman Capote, but my sentiment still remains: Hoffman is very deserving of yet another Oscar win. But where the acting shined (shone? ), the story fell apart. It wasn’t a horrible story but I did have many issues with it. The movie seemed to endlessly drag on from scene to scene, not because it was boring, but because it wasn’t clear what was going on all the time. The beginning in particular is difficult to watch because it’s when you first get acquainted with these characters and when you first start trying to put the pieces together. Anderson chose to focus solely on character development in the beginning and not introduce the main plot until what felt like a half-hour in. The Master is strong on the acting and weak on the story. While I feel There Will Be Blood is better, The Master looks and feels very similar. That’s to say if you’re a fan of one, you should give the other a chance because if anything, The Master is a unique film that is not an average blockbuster film.